Mount Merapi still continued to show increased activity during the week since the eruption of October 26, 2010. Today also reported that the activity of 22 mountains in other parts of Indonesia also rose. Although Merapi look very active, but its activity is still not the worst when compared to other mountains. There are many other volcanoes in the world that is more active. This is a list of five most active volcano in the world based on reports Paul Kimberly, Program Manager of Global volcanism, Smithsonian Institution. Liveliness viewed from a long time active volcano constantly. 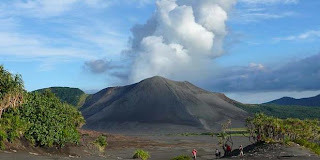 The mountain is located on Tanna Island, part of the island nation of Vanuatu in the South Pacific. The height of the mountain is only 361 meters, but its activity has been going on continuously for 111 years. The mountain is also located in Italy. Has a height of 3340 meters, this mountain has been active continuously for 109 years. Etna eruption most severe occurred in 1669. This mountain has been active continuously for 108 years. Located in Italy, the mountain is often called the Lighthouse of the Mediterranean. One of the eruption in 2002 caused a small tsunami and damage in the village of Stromboli, located adjacent to it. Mount Saint Mary is located in Guatemala. This mountain reaches a height of 3772 meters. The biggest eruption was in 1902 and is one of the largest eruptions during the 20th century. This mountain has been active continuously for 101 years. Mountain, located in Ecuador has been active continuously for 94 years. Initial eruptive activity was found in 1628. Meanwhile, continuous eruptive activity was recorded from 1728 until 1916 and in 1934 up to now. The height of this mountain is 5230 meters.